Before you make the move with your appliances, clean your washer of any detergent residue by running the washer on a hot cycle along with ¾ a cup of vinegar. Afterwards, use a damp cloth to remove any other buildup such as dust or spilled liquids and let it dry out. 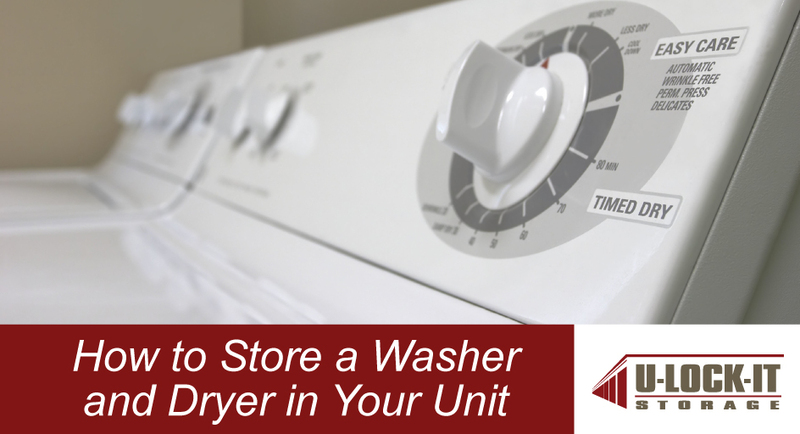 Next, clean out your dryer with a damp cloth, turn off electricity breakers, turn off the gas supply valve, and disconnect the machine. Your final actions should be to shut off the water supply to the hoses, then switch off the electricity breakers connected to it. Once you have disconnected the washer, remove the hoses and you are ready for the next stage. Washers and dryers are not cheap appliances. That is why before moving them into your unit, you should check your washer’s manual first to see if it has any specific instructions on how to move it. Some washers may even have come with a moving kit to allow for a safe transportation. If you can’t find a manual, contact a professional technician who may be able to advise you on the best method to carefully move it. The last thing you need is to fix a broken appliance on your move-in day. As soon as you understand how to move your appliances, you should get them prepped and protected so they aren’t damaged during the moving process. You can do this by wrapping them in blankets and bubble wrap to prevent scratches or bumps. Use a dolly to get it into the van and load them first before anything else or along with any other heavy appliances you need to move. Once they are loaded, keep them secure by attaching them to the walls of the van with adjustable straps. Store both the washer and dryer off of the ground to avoid possible water damage by setting them on something sturdy such as wooden pallets. To keep them from collecting dirt, leave them wrapped in the blankets and bubble or shrink wrap you may have used to transport them. Also look at what you are storing around the washer and dryer. Do you see anything that could potentially fall and damage them? Do you see anything that could possibly leak? Protect your appliances by storing them a safe distance from anything that could cause harm. By correctly cleaning, unhooking, transporting, and storing your washer and dryer, it is possible for them to be brought out of storage and function as good as new when you need them again. As with storing anything, the treatment and placement of an item in storage goes a long way in ensuring they are preserved in their best condition. At U-Lock-It Storage, we provide the best storage units to ensure your valuables are kept safe. Take advantage of our climate controlled units that will keep your items safely stored all season long. To rent yours today, give us a call at 256-373-5495. We’ve got you covered.